This is my first bloom out of the sunflower patch, so excited! Though the seed packets lied in the 6 to 7ft tall claim, mine are only about 4-5ft tall. But still pretty,maybe it's just the heat that is stunting their growth. 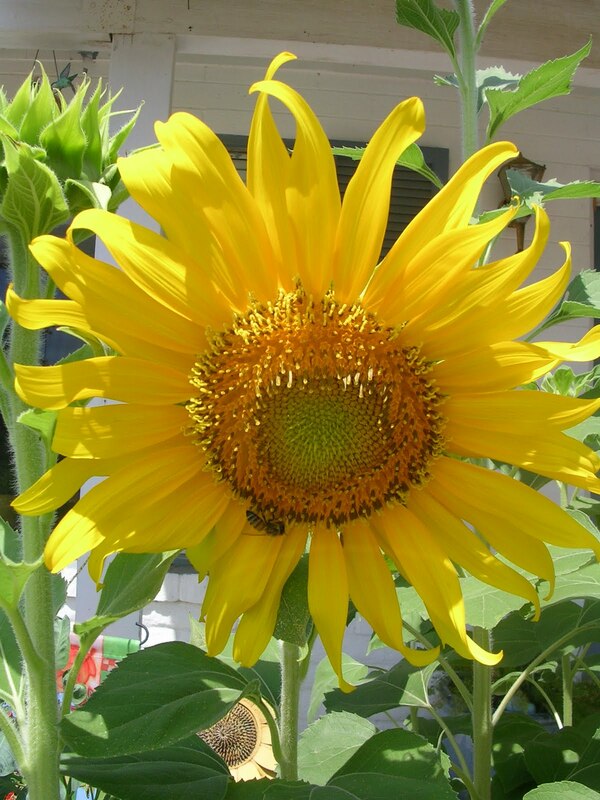 There is a little bee perched on the bottom left of the sunflower, see him? These are all my recent finishes. By showing you them here in all their unfinished glory I am trying to shame myself into actually finishing them into something pretty and display-worthy. 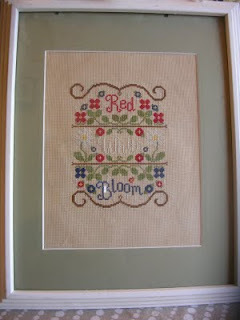 People ask me all the time how many cross stitches I have hung up in my house. 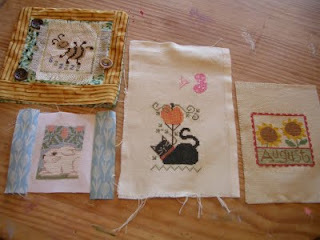 Well i've been stitching for 20 years now, so you would think I have more than a few. But really I only have maybe 15 out on display. I know I have stitched more than that, so in a recent clean up of the craft room I did a count of my finishes, and WIP. I'm gonna take a deep breath now and admit my secret....I have THIRTY FOUR finished/not finished peices stuffed in a bag on a shelf in my craft room, and TWENTY SEVEN works in progress....EEK! So my goal for the year is to get every single finished pieced out of that bag and up on a wall, made into an ornament, or given as a gift by the end of this year. I didn't put all that work into them just to have them sit in a bag. 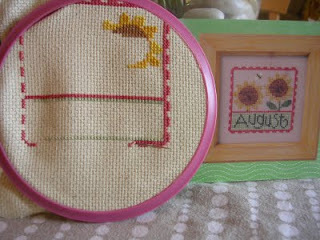 Though most of the joy of stitching for me is in the stitching itself, not necessarily the finished project. I am still pondering a way to hold myself accountable on the finishes. I'm thinking a little sidebar list, where I can cross out the finishes as I go. 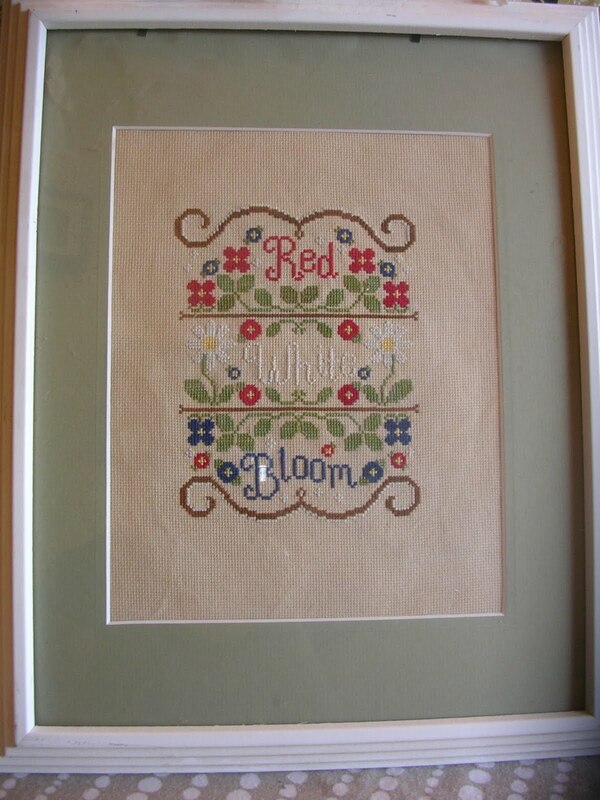 And this is my Mount Everest cross stitch. 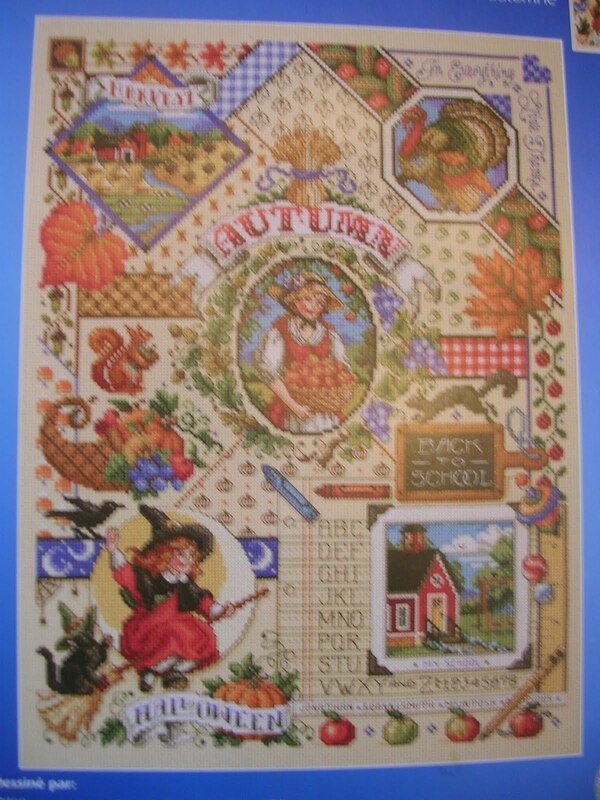 It is a Sandy Orton design, Autumn Sampler, measuring 14" by 18". And it's not solid stitching. 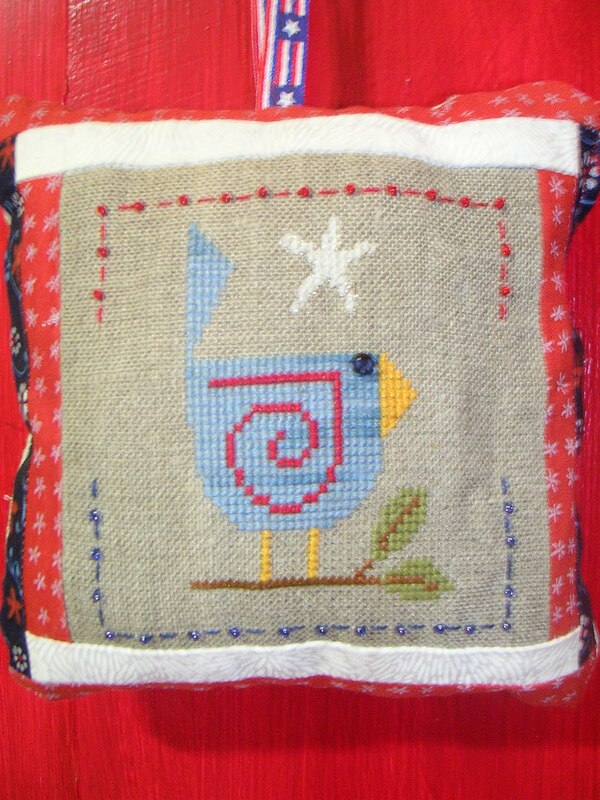 It has little designs that are fun to finish, but lots of details and backstitching, and thread changes. So this is the piece that has taken me 4 years to get this far on, and will probably be another two before it's done. I am reconsidering doing the other 3 seasons ( I have already started the Spring Sampler). On the non-stitchy front this is what has been taking up the rest of my time. 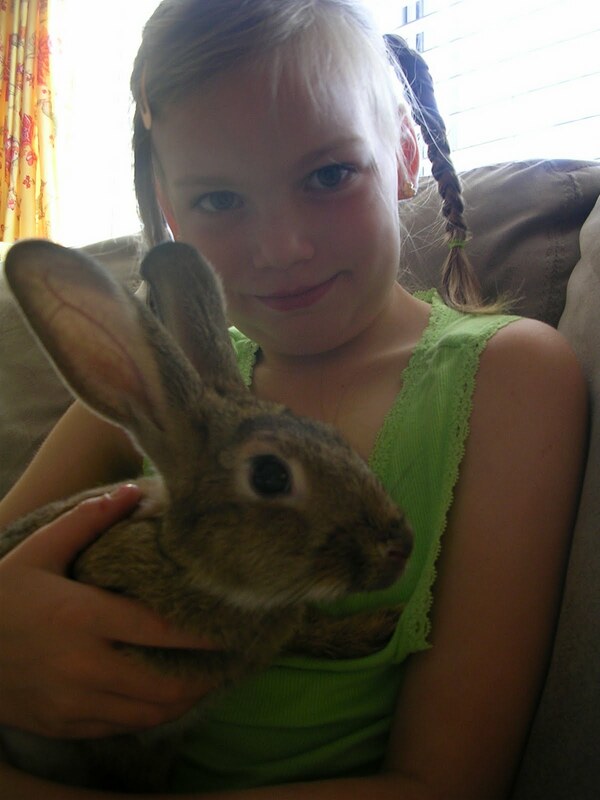 We adopted a new bunny, Gypsy. Who so far has done very well with the chaos and children and dogs in our household (I was a little worried we would give new bunny a heart attack). 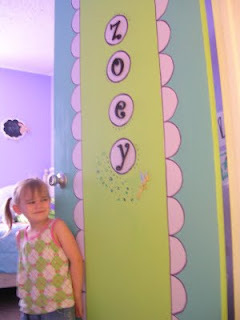 Also I finished Zoey's door this week. 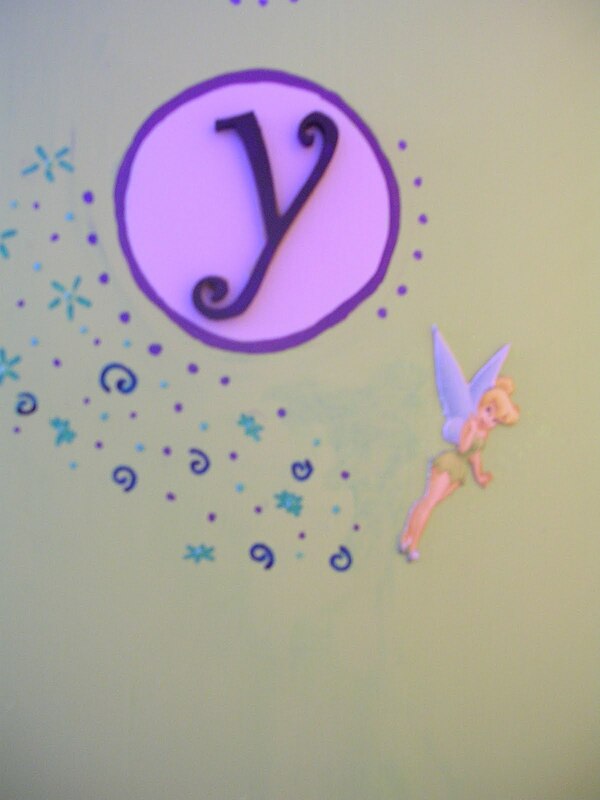 I chickened out on painting Tinkerbell on it myself, and instead found a cute wooden cut out to glue on (like the letters for her name). I also painted a cloud of glitter/fairy dust around her that doesn't show up very well in my pics. 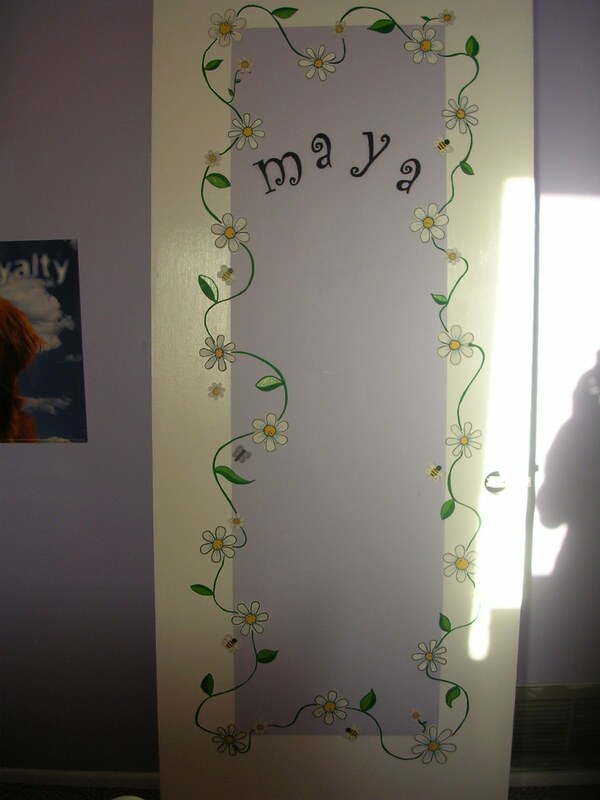 I'm just happy she has a door again. 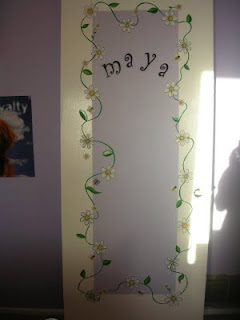 Ok, first things first...my giveaway ( a day late but for me thats almost early!) The winner is #2 Nataly of Nataly's Needle Creations picked by random.org. Which is funny, because I actually won a great giveaway on her blog a few weeks back. So congratulations Nataly, I think I still have your address and will get the goodies mailed out next week. 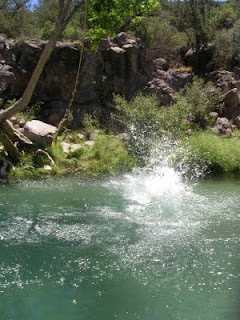 So camping was great, the girls had lots of fun swimming, trying to catch fish, lizards, and frogs. We had a resident skunk come into our camp each night, but nobody got sprayed. There was a full moon each night, so even though we couldn't have campfires (due to the recent Arizona wildfires that burned up half our state) we still sat out at night. All in all a great summer camping trip. This is my latest finish. 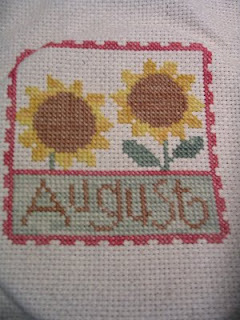 "August" by Lizzie Kate. I have a huge Autumn sampler I need to pull out and work on, but it's so big I just can't get motivated to even start on it. I know I won't finish it this year, and this is year four of stitching.I still love it though, and can't wait to see it hung on my wall. 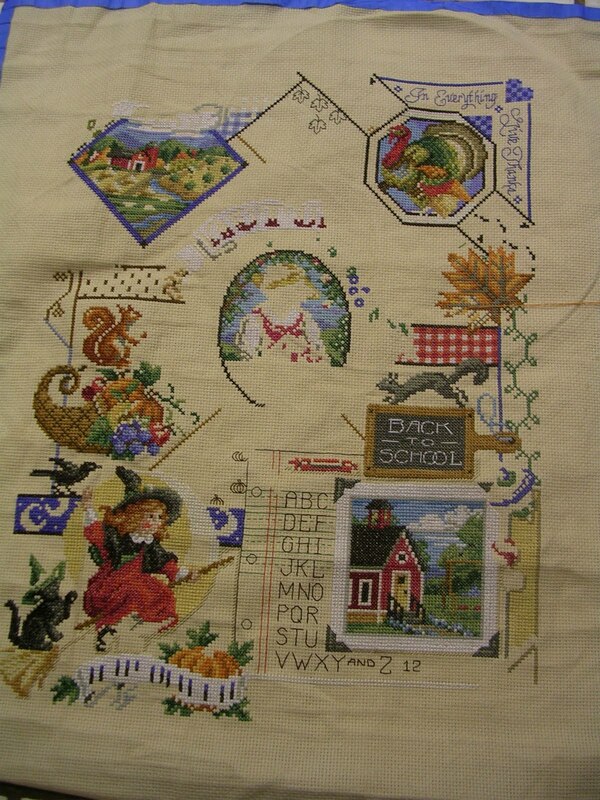 I'm trying to motivate myself to work on it a bit before moving on to Halloween stitching. It is only July after all! 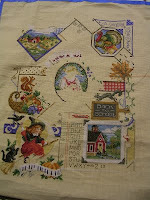 And this is the rest of what I have been doing with my week (busy week I know!) I painted both my girl's doors. 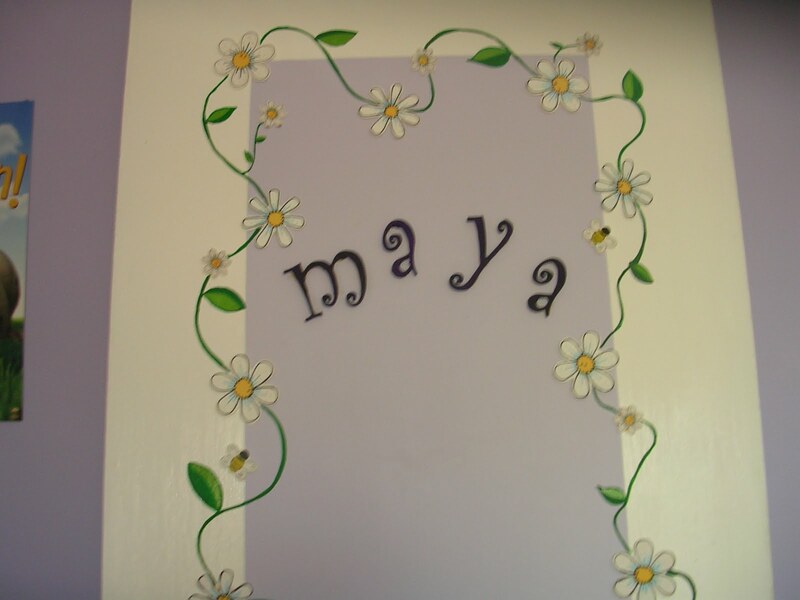 Maya's I think is done, she loves it, purple is her favorite color and she helped me paint the wood letters of her name. Zoey's I am still debating wether to try and paint Tinkerbell on it, or just search for a decal/sticker thing and hope it doesn't peel off in a week. Yes, yes I finally (after 2 years of on and off again blogging) got around to having my own giveaway. But first my fifth of July finish. My stitching mojo failed me last week, and I was struggling to get this one done by the 4th of July for my seasonal decorating. Well I did manage to finish it on the 4th, but it was not framed and hung in my home until today. Overall I like it, the white still does not stand out as much as in the chart. Now onto my very first give-away! The little pillow is a Bent Creek design, called red-winged blackbird, who is obviously now a red-winged blue bird in honor of summer. I'm also giving away a patriotic chart to go with. 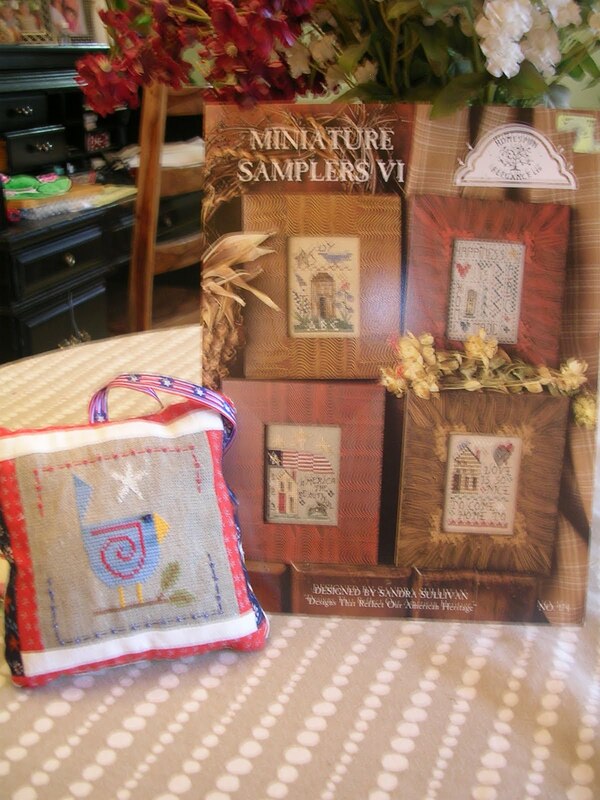 It's a Homespun Elegance chart with 4 cute little house/sampler designs. So if you'd like to win, leave me a comment and i'll pick a winner on July 15th. And this is my next project. I have decided that from here through November it will be all Autumn/Halloween stitching all the time (you can't hold me to this though). So my first project is a Lizzie Kate flip it for August. I have a bunch of Lizzie Kate Halloween flip it block's started also, and a huge fall piece that is this close to being done. This one will probably be the only new project started and the rest of the season will be spent finishing old ones. I love decorating for fall (it's my favorite season), but i'm making myself wait until August 1st to start putting out my fall displays. When you live in one of the hottest cities in America it's hard to stay thrilled about summertime for long. 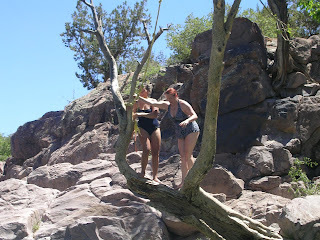 Hope everyone had a wonderful 4th of July, and is enjoying summertime in slightly cooler climates!